A great item to use for favors at your special celebration! Select any of our beautiful handmade papers, including Grow-A-Note® plantable seed paper or handmade specialty paper, or have them made with our exclusive Hemp Heritage® paper. 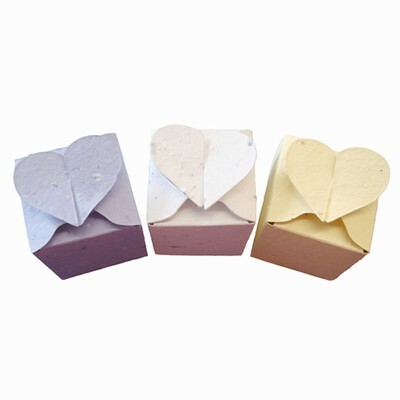 Our Grow-A-Note® paper makes this box a gift within a gift- whatever you decide to fill it with! Plant the box and wildflowers will grow with daily watering. *Boxes ship flat with acid free double-sided tape. Assembly required. Please call to order.